Home \ Uncategorized \ The BEST Birthday Freebies: Free FOOD, FREE Makeup, FREE Toys and More! As promised in my Birthday Freebies Video, here are a bunch of the BEST Birthday Freebies you can sign up for and have all of your kids sign up for too! IMPORTANT NOTE: You have to sign up for each offer BEFORE the month of your Birthday in order to get these offers emailed to you. 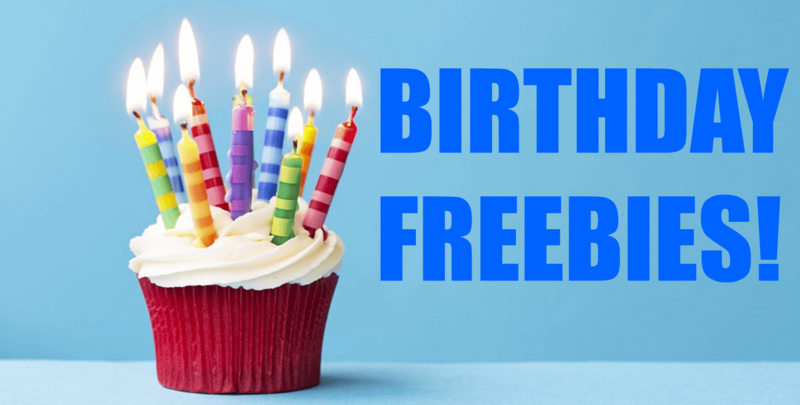 You must either print out the offer from your email or show it on your phone for most places to accept your Birthday freebie. American Eagle– Get a 15% off coupon the month of your birthday! AMF Bowling– Get a special deal every year for your birthday! Anthropologie– Get a 15% off coupon for your birthday! Applebees– Get a FREE dessert! Arby’s Birthday Club-Get a FREE birthday surprise! Auntie Anne’s Birthday club– Get a FREE pretzel! Aveda– Get a FREE Pure-Fume on your birthday! Barnes & Noble– For KIDS: Get a FREE cupcake from their cafe and a FREE digital book created by your child on Tikatok.com! Ben & Jerry’s– Get FREE ice cream! Benihana– Get a Birthday Dinner certificate worth $30 to use during the month of your birthday! Blue Bell– Get a certificate for a FREE half gallon of blue Bell Ice Cream during the month of your birthday! Boondocks– Get an unlimited FREE day pass! Boston Market– Kids 12 and under will get a FREE kid’s meal, drink, and dessert! Buca di Beppo– Get FREE Food! You can enroll your entire family. Burger King– Get a FREE Kid’s birthday meal! California Pizza Kitchen– For Kids: Get a FREE CPKids meal during the month of their birthday! Carrabba’s Italian Grill– Get a B1G1 FREE entree coupon! Carvel– Get a special treat on your birthday! Chick-fil-A– Get a FREE birthday surprise! Chili’s– Get a FREE dessert! Chuck E. Cheese’s– Get FREE birthday tokens! Claim Jumper– Get a FREE dessert on your birthday! Cold Stone Creamery– Get a treat on your birthday! Del Taco– Get a FREE premium shake for your birthday! Denny’s– Get a FREE Grand Slam on your birthday! Dickey’s Barbecue Pit-Get a B1G1 FREE Sandwich coupon! Dippin’ Dots– Get coupons the week of your birthday! Express– Become an A Lister and get a FREE $40 Gift Card to Use on Your Birthday! Famous Footwear-Get a FREE birthday surprise! Firehouse Subs– Get a FREE sub on your birthday! Golden Corral-Get a FREE meal to Birthday Club members during birthday month. For Kids Too! Hard Rock Cafe– Get a FREE dessert on your birthday! Jack-in-th-Box– Get a FREE dessert for your birthday! Joe’s Crab Shack– Get a free piece of cake. Johnny Rockets-Get a FREE birthday surprise! Krispy Kreme– Get a Free Donut! Macaroni Grill– Get a FREE dessert. Maggiano’s– Get a coupon for $10 off your meal purchase. Maggie Moo’s-Get a FREE birthday surprise! Marble Slab Creamery-Get a birthday surprise! Medieval Times– Get a FREE Feast and Tournament! Mimi’s cafe– Get a FREE entree w/purchase for your birthday! Noodles & co– Get a coupon for a FREE dish on your birthday. Nothing Bundt Cakes– Get special offers for your birthday! Old Navy-Get a special treat on your birthday! Orange Julius– Get a FREE Birthday drink coupon emailed to you! P.F. Changs– Get a FREE dessert on your birthday. Papa Murphy’s-Get FREE cookie dough on your birthday! Qboda-Get a FREE birthday surprise! Red Lobster-Get a surprise for your birthday. Red Robin– Get a coupon for aFREE burger on your birthday. This is for all ages! Rita’s-Get a special birthday treat! Rodizio Grill– Get a special offer on your birthday! Sephora– Get a FREE gift from Sephora on your birthday. Sonic– FOR KIDS: Get a FREE Wacky Pack during the week of their birthday. Starbucks-Get a FREE birthday drink! Taco Time– Get a FREE kid’s meal on their next birthday. Tanger Outlet– Get FREE birthday rewards– might include a gift card for your first year of membership as well. Texas Roadhouse– Get a coupon for a FREE dessert or appetizer on your birthday. TGIFridays-Get a coupon for a FREE appetizer. You must be over 21 to get this birthday freebie. The Children’s Place– Get coupons on your birthday. Torrid– Get a birthday gift! Toys R Us– FOR KIDS: FREE $3 Coupon to Use on Anything Children ages 2 – 10 wish. Tropical Smoothie Cafe– Get a special birthday surprise! Tucanos– Get a FREE entree for your birthday! Ulta Beauty– Get a special birthday surprise! Victoria’s Secret-Get special offers for your birthday! World Market– Get a surprise birthday gift! Zaxby’s– Get a FREE Kids Meal card for your birthday!